What If The Joker Had Stayed Dead? It is the year 1940. 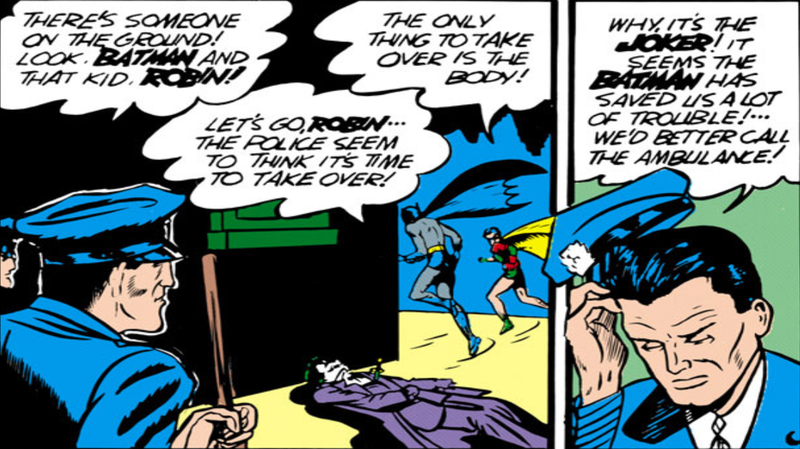 The Joker is being chased by the Batman & Robin after falling for the cape crusaders trap. In desperation, the Joker tries to maul the Batman, but accidentally stabs himself with his own knife. The Joker falls to the ground as the reader is informed that he did not survive his injuries and died. Welcome again to Observation Deck’s What If. This is where we change one thing of a film, TV series, comic etc, then study and examine the consequences. After child death, corporate espionage and marriage, this week we’ll wonder on what would have happened if the Joker, Batman’s most famous foe stayed dead after his second appearance in 1940. What If Anakin Died In Episode One? What If Biosyn Had Succeed With Their Plans? What If Lily Had Chosen Snape Over James? Some fans will know that this was supposed to be the Joker’s fate as it was not common to have recurring villains in comics at that time (it’s why they went through two Red Skulls in the Captain America books). But what would be a world without the Joker? If he was just some obscure villain that people talk about when discussing Batman’s early history? Please feel free to use any media for your analysis and theories and remember that there is no idea to silly or weird here. The biggest question needed to be ask is whether or not Batman would have lasted if there was no Joker for him to chase? Remember that Joker after his two appearance in Batman #1 would then go on to appear seven more times in the span of only 12 issues. Pesonally though, I do think the cape crusader would still be around, but he wouldn’t be the famous and well-known superhero we know today. Instead, he’d probably in the same vein as Captain Marvel or Hawkman, known in comic book circles and remembered for being massive in the Golden Age, but still a B/C lister. You also have a domino effect happen as without Joker being around, there would be no Red-Hood meaning Under the Red Hood and Red Hood and the Outlaws wouldn’t have happened. There would be no Oracle meaning no Birds of Prey or any of the future Batgirls. Then of course, no Joker, no Harley Quinn.